My lovely part time dietitian Kate is popping in today to share some times for letting go of food and diet rules on vacation, and some food highlights from a recent trip to Nashville. She’s currently accepting new virtual clients for evenings and weekends! If you read Rachael’s recent post, “How to Stop Bingeing on the Weekend,” hopefully you gained a great tip or two on how to normalize eating over the weekend. My former self could certainly relate to the idea of “saving up” for weekend splurges. At one point in my life, vacations and weekend trips also led to that sort of mindset for me too. This has been on my mind as I just recently returned from a trip to Nashville, Tennessee to visit with some close friends. Coming back home, I was absolutely exhausted thanks to late flight times, but I was thoroughly satisfied with a fun trip. The trip involved lots of delicious eats, sightseeing, late night dancing, and meeting my friend’s baby for the first time. This mini-vacation was a great time for me to disconnect from everyday life and focus on totally enjoying myself. Without a doubt, one of the best parts of going on vacation is the food. Traveling away from home and going to new places to eat adds to the adventure of the trip. Hitting up local hot spots and the city’s staples is essential to immersing yourself in your surroundings. Anthony Bourdain reruns can inspire us all! However, thoughts around “vacation eating” can trigger negative feelings for people. If your first instinct is to diet when you return home, don’t feel alone. This is a common reaction perpetuated by messaging all around us. Thanks to years of retraining my brain, I’ve noticed how different from that line of thinking my trips have progressively become. Rather than fretting over what diet changes I’ll engage in when I return to make up for my “vacation eating”, I can now enjoy myself fully and then return to life as scheduled (sans-dieting) when I get back home. If easily adjusting back to regular life feels far off from a reality to you, know that society and the culture of dieting are at least partly to blame. The sort of messaging we hear all summer long about getting “bikini ready” (eyeroll) and then every January telling us it’s time detox feeds into how we view eating on vacation. There’s no need to ruin your vacation with feelings of dread because you have a diet to return to when you get home. It took lots of practice to shift my mindset to not seeing “vacation eating” as the forbidden fruit, but overtime I was able to find a new, healthier mindset. Ditch the idea of “forbidden foods” all together and regularly include foods you enjoy in your diet. This one starts before even planning your trip, but it is the best way to set yourself up for a stress-free vacation, and life post-vacation. Understanding that no foods are off-limits can help you to not go into your vacation already feeling deprived. Seeing a vacation as your only time to eat what you truly enjoy sets you up for the restrict/binge cycle. Choose to include food you enjoy year around so that you can put less gravity on what you’ll eat on vacation. First meal in Nashville was a cute little place called “Stay Golden.” My friend and I wanted to have a sweet and savory combination. She wanted the potatoes and I wanted the waffle. The waitress made sure to let us know it was a “carby” meal, but I was able to let that slide because I knew it was what sounded best to us in the moment. We went with our order and it was delicious! I love having someone to split something with which means I get to try two meals. Understand that eating past fullness will likely happen, and that’s okay! Just a few hours after our delicious brunch that was filling, we found ourselves near a Jeni’s Ice Cream. I have to stop at Jeni’s when I’m Nashville. Their ice cream deserves all the awards. Even though I was still full from brunch, I did not want to pass up the opportunity to eat my favorite ice cream. This happens! On vacation you may find yourself eating more for pleasure than hunger and that’s alright. The timing of when you eat may be affected by what other plans you have, so eating may be dictated by convenience more so than hunger as well. Take your time to mindfully enjoy the meal/snack and move on. Read more on mindful eating here. Add in some non-food related adventures. Food is super fun, but what else can you do to fill your (emotional) cup? I love sightseeing and browsing local shops and visiting parks and murals. Do some research ahead of time and make your time count. Don’t lose sight of the purpose of your vacation: to relax, have some fun, spend time with people you love, and have new experiences! If you find your mind wanting to drift towards negatively obsessing over food, take a minute to refocus on the purpose of your trip. I know, I know. Mural pictures maybe cliche, but this one spoke to me! When you let go of diet rules and your default is not to restrict your intake, you are likely to self-regulate without much thought. Planning to diet when you get home can lead to feeling like you need to load up on foods while on vacation in fear of not having them again until your next trip. When I returned home, I went to the grocery store and bought foods that I would normally buy. I cooked meals that I would normally eat. Vacations are a great time to try new foods you normally wouldn’t have access to or maybe wouldn’t spend money on. If you’re like me you may need to take a few weeks off from eating out, not for the purposes of “detoxing”, but to take time to recoup from all the money spent! I go back to eating foods I typically enjoy on a daily basis without much thought. I skip the deprivation cycle by aiming to create some of those fun moments I had on vacation: cue me trying to re-make the delicious burger I had at Shake Shack at home! My first experience with Shake Shack. No lie, this may have been one of my favorite burgers ever. The Shack Shake sauce knocked my socks off. Sometimes I wish I could go back an do over all my vacations when I didn’t have this mindset. 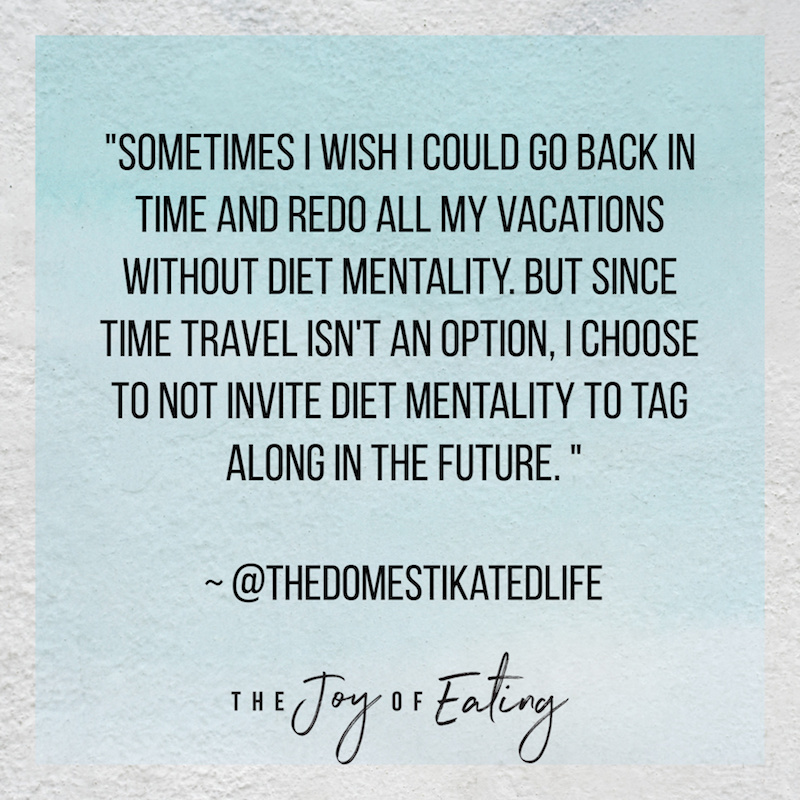 Since time travel isn’t an option yet, let’s vow to stop inviting diet mentality to tag along on our future vacations!